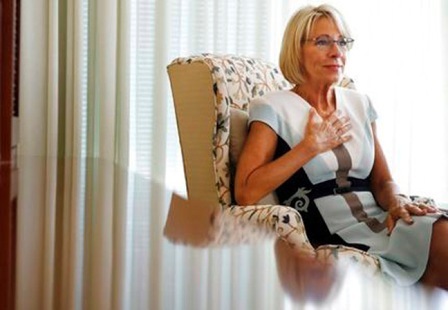 “I’ve had these conversations with some of the African-American organizations that represent higher education, but probably not as explicitly as I am right now," DeVos said. The issue of minorities’ access to higher education remains controversial today. The Justice Depart­ment said last week it would conduct an inquiry into how race influences admissions at Harvard University after a coalition of more than 60 Asian-American groups brought a complaint alleging the school uses race as a factor in admissions and discriminates against Asian-Americans by holding them to a higher standard. “It is not fair to think that when students transit through a K-12 system that is not preparing them for beyond, that somehow we are going to waive a magic wand and things are going to be perfect for them at the higher-ed level,” DeVos said.